When I was in school, science was taught in a lab complete with bunsen burners and the heady pong of phosphorus. The Periodic Table was tacked to the wall and we were frequently tested on formulae which I can confidently state I have never used since, with the possible exception of some unfortunate experimental cooking. Caitlin was recently sent the Project Mc2 Ultimate Lab Kit to test so I was obviously the natural choice of assistant. 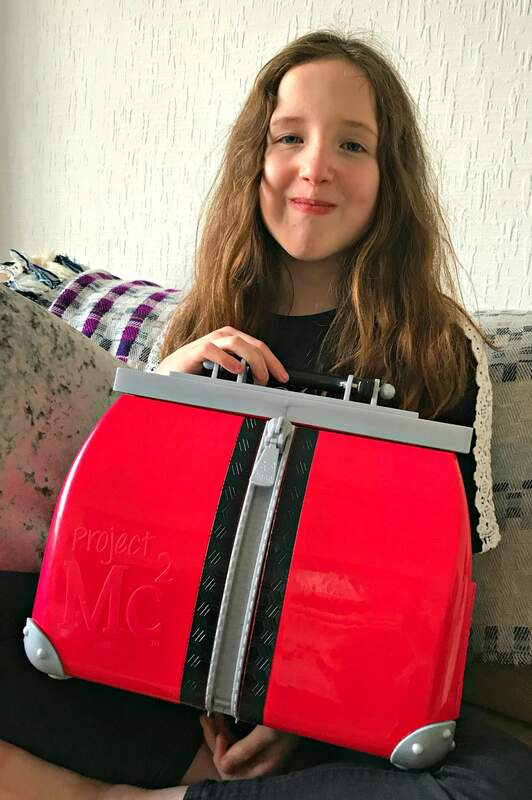 If you caught our recent review of the Project Mc2 Pixel Purse, you’ll know that we are new to the Netflix series Project Mc2 and particularly enjoying the growth in interest in STEM based projects for kids and the recognition that science is for everyone, not just boys. STEM (Science, Technology, Engineering, and Maths) is all about building a love for learning and a solid base for understanding key concepts later on as your children work through the Key Stages in school. Heroine McKeyla McAlister and her friends work for a secret government organisation called NOV8 (“innovate”) and they protect the world using their science and technology skills. 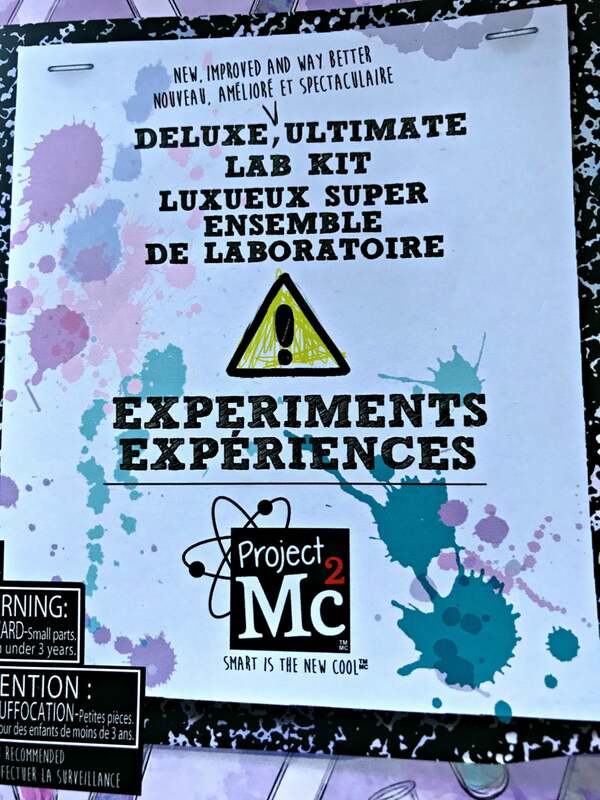 What’s in the Project Mc2 Ultimate Lab Kit? 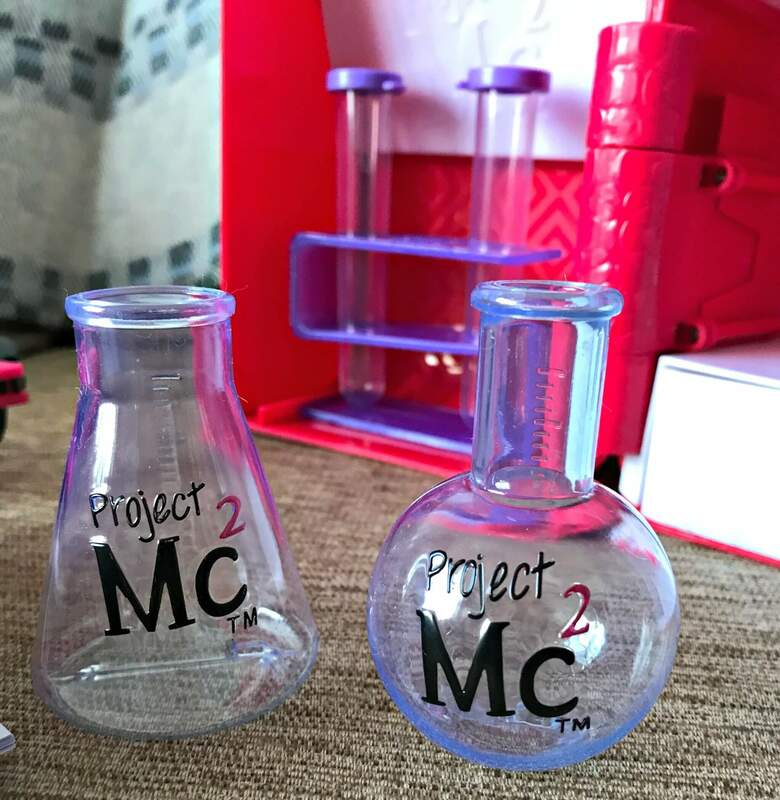 The Project Mc2 Ultimate Lab Kit is a great asset for any new NOV8 recruit. The kit comes in a sturdy red case designed like a bag which, when opened reveals a great selection of toy science equipment and a mini booklet which contains over 30 experiments you can try using ingredients you are likely to already have at home, or which you can easily find in your local supermarket. 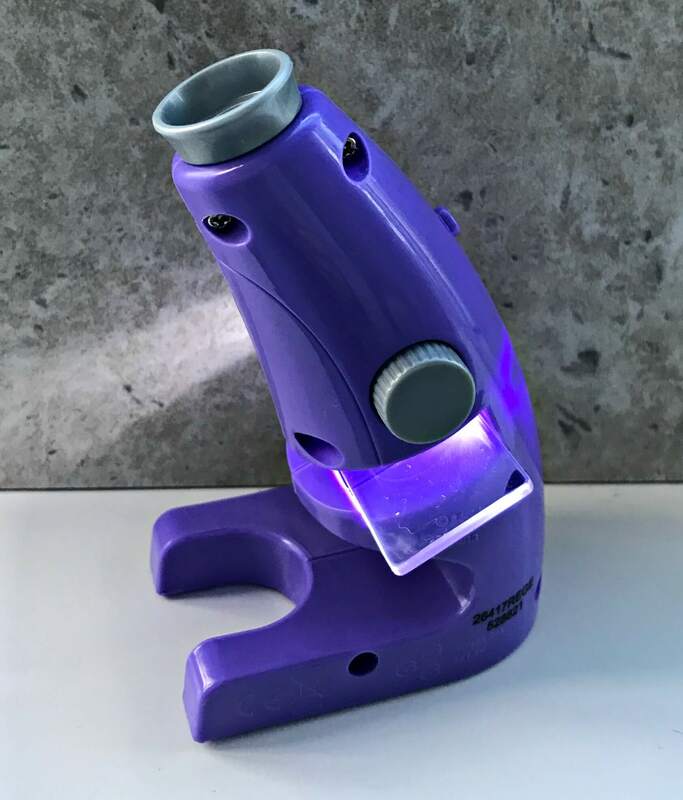 The Project Mc2 Ultimate Lab Kit contains a real working microscope with 4x power (batteries required). 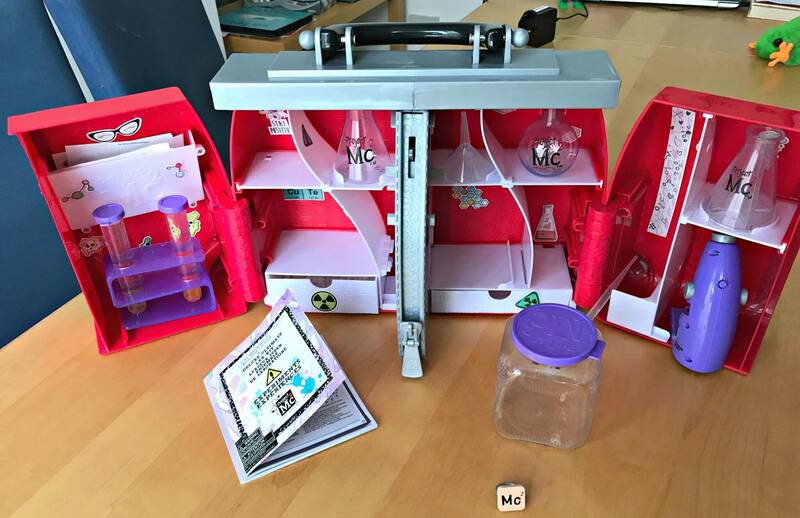 Inside you’ll also find 30+ additional pieces including 3 glass slides, 2 test tubes with a stand, a funnel, a beaker jar, 3 lab flasks, 15 pH strips, a pipette dropper, a petri dish, safety goggles, a Project Mc² ring, and 2 sticker sheets to examine and decorate. The microscope does work but don’t expect miracles. It does allow you to demonstrate how one works and the principle of examining things on slides. There is enough contained within to keep even the most curious budding scientist occupied for hours, particularly if mum and dad join in the experimentation. We tried 3 of the experiments with, it has to be said, varying success. Fill the jar with a little boiling water and then spritz some hairspray into the jar. Flip the lid over and put some ice cubes on top of the lid. After a few moments lift the lid. This shows you that the cloud forms because the boiling water creates a lot of warm water vapour which is cooled by the ice forming loads of tiny water droplets – in other words, a cloud. You are supposed to remove the lid to let the cloud escape but we found keeping the cloud jar-bound gave a better result. We then tried to make giant gummy bears. You place two gummy bears in the test-tubes, add a little water and wait for them to grow. This demonstrates the process of osmosis where the water is completely absorbed by the sweet. In our case, however, the gummy bears dissolved completely! Our best success was at making foam dough. 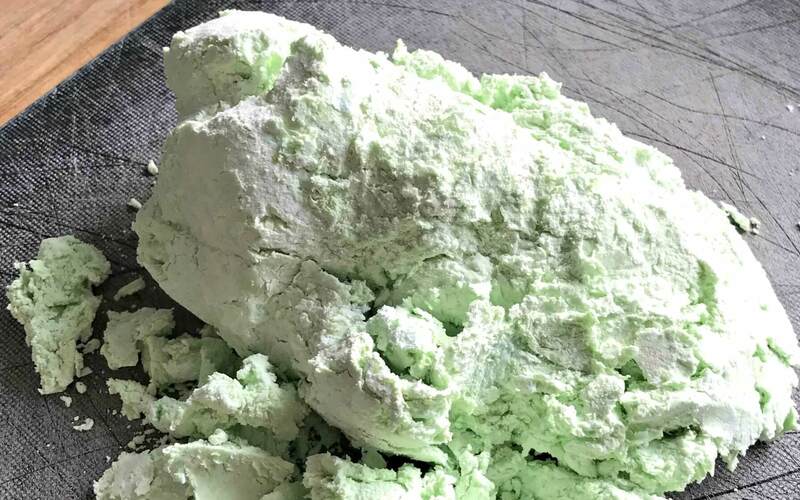 This is a mixture of cornflour, shaving cream and food colouring which, when mixed together, creates a very oddly textured type of dough. Just be aware that coloured dough can equal a bit of mess and the smell of the shaving cream does tend to linger so don’t use your best mixing bowl! Despite the fact that our results were patchy, this is a great kit which offers endless opportunities for experimentation. Other experiments include things like “make Fake Boogers”, “make a red cabbage PH indicator” and “make a rainbow in a jar”. 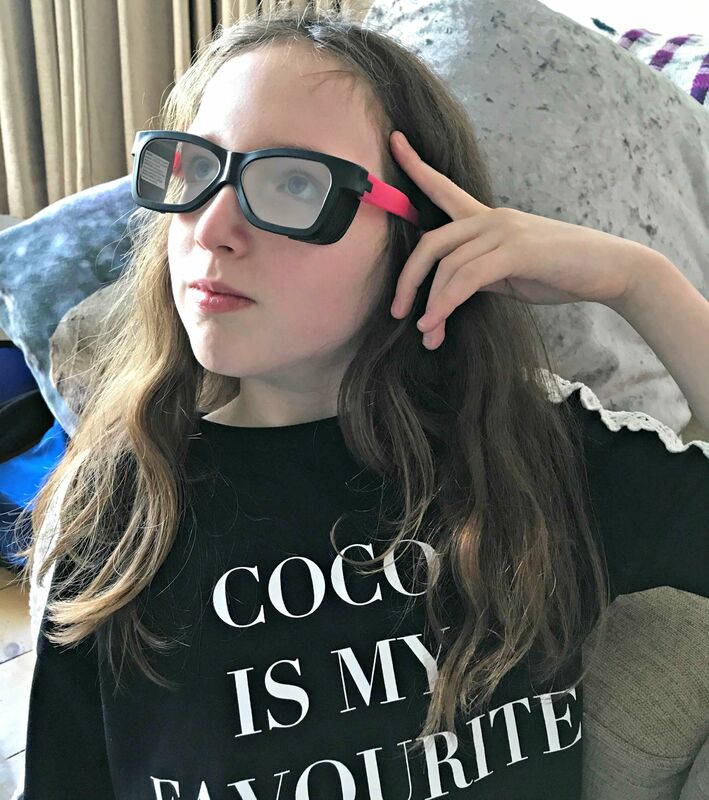 The experiments are a great starting point for explaining the basic scientific theory and, of course, time spent with your kids away from tablets and PCs has a particularly special value these days. There is no reason why you couldn’t then go on to devise your own experiments, whether you use the kit or not. 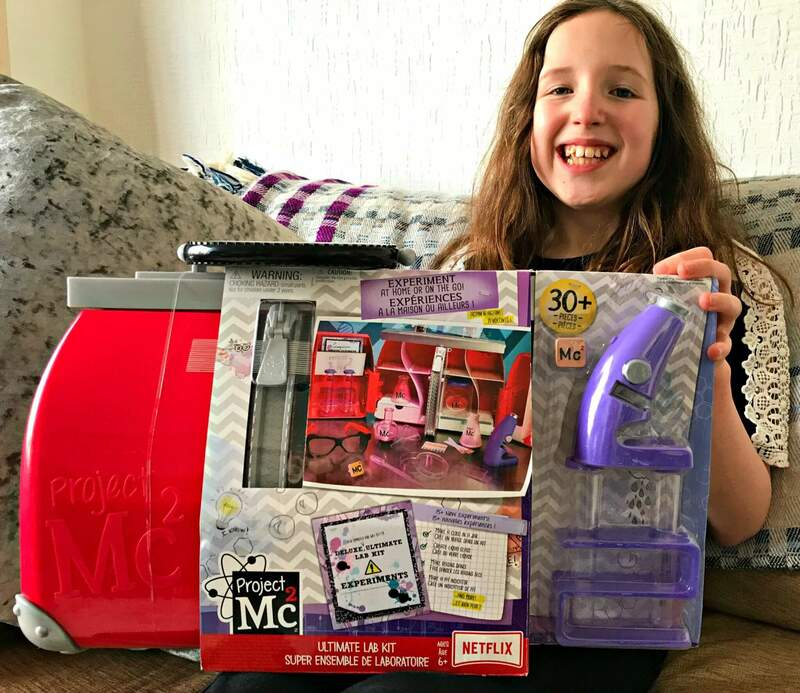 We thought the Project Mc2 Ultimate Lab Kit was, like the Pixel Purse, a well made, well thought out toy which offers a gentle introduction to science. The experiments break down various scientific topics in a way which is easy to grasp and fun to explore. The Project Mc2 Ultimate Lab Kit is suitable for ages 6+ and is available from Amazon, Argos, Smyths, Tescos and ToysRus. "Quick & Easy Money Saving Tips For Busy Parents"
What an absolutely awesome sounding kit is this! I hands up would have loved something like it as a child and it is great how learning can be so much fun now! Ooooooh, I love these experiments – much better than the boring ones we did as children! Oh my girls LOVE project MC2 and I love seeing them play with the range, I’,m a huge advocate of STEM subjects for women. This looks like so much fun! Oh my gosh, I would have absolutely have lost my mind as a kid – it looks incredible! This looks like an amazing science kit full of fun experiments for the kids to try out. The foam dough sounds fab – something I know my kids would love to make! This looks like a great kit! My kids would probably really enjoy this as well! My son is mad about experimenting and would absolute love this.